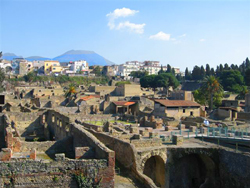 According to tradition, Herculaneum was founded by Hercules. Like Pompeii the Roman town was buried during the AD 79 eruption of Vesuvius. Numerous craftsmen and many rich and cultured patricians were drawn to the resort of Herculaneum because of its beautiful setting, overlooking the Bay of Naples. In 1997 Herculaneum was included in UNESCO’s World heritage List. Herculaneum is broadly divided into five sections which are delineated by the two main streets (decumani) and three other thoroughfares (cardi). The town has various examples of different types of dwellings, all of which were overwhelmed by the sea of mud seeped into every nook. The particular interest of a visit to Herculaneum is that all timber structures (frameworks, beams, doors, stairs and partitions) were preserved by a hard shell of solidified mud, whereas at Pompeii they were consumed by fire. The houses were empty, but death caught up with the inhabitants as they tried to flee the city or make for the sea. The Casa dell’Albergo was about to be converted into apartments for letting, hence its name. This vast patrician villa was one of the most badly damaged by the eruption. The Casa dell’Atrio a mosaico takes its name from the chequered mosaic in the floor in the atrium. The garden on the right is surrounded by a peristyle. On the left are the bedrooms and at the far end, a pleasant triclinium (dining room). The terrace, flanked by two small rest rooms, offers an attractive view of the sea. In the Casa a graticcio, the framework (graticcio) of the walls was formed by a wooden trellis. It is a unique example of this type of house from Antiquity. With its façade remarkably well preserved, the Casa del Tramezzo carbonizzato is a good example of a patrician dwelling which housed several families. The atrium is separated from the tablinium (living room) by a wooden partition (tramezzo). Only the sides of partition remain standing. Arrange with us a tour with a private guide in Herculaneum.